Former Japanese peace envoy Yashushi Akashi yesterday said that a recently conducted census in the Northern and Eastern Provinces could help Sri Lanka to establish the number of civilians killed in the final phase of the conflict in 2009. The 80-year-old Japanese special envoy said that census could drastically bring down varying counts of deaths given by different parties. Akashi was responding to a recent statement attributed to Defence Secretary Gotabhaya Rajapaksa that the government would shortly reveal a census carried out by Tamil public servants in the Northern Province. After meeting President Mahinda Rajapaksa and External Affairs Minister Prof. G.L. Peiris yesterday, Akashi told the media that the census could help Sri Lanka establish accurate figures in relation to the final phase of the conflict. Akashi fielded questions at the External Affairs Ministry along with Prof. Peiris. Sri Lanka’s Ambassador in Tokyo, Admiral (retd) Wasantha Karannagoda and Japanese Ambassador in Colombo, Nobuhitho Hobo and First Secretary of the Japanese embassy, Hokuto Kaya, were present. Commenting on the post-war national reconciliation process, Akashi, who had worked closely with the then Norwegian peace envoy, Erik Soheim and the then Chief Sri Lankan peace negotiator, Prof. G. L. Peiris, said that the country could move forward on the basis of the Lessons Learnt and Reconciliation Commission’s report. 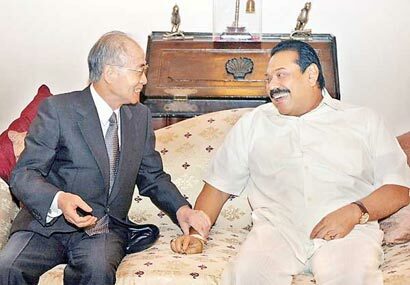 Akashi said that Japan eagerly awaited the release of the LLRC report with President Rajapaksa tabling it in parliament shortly. In answer to a question by The Island, Akashi said that he hadn’t read the full report, which dealt with the Norwegian peace process in Sri Lanka, though he had an opportunity to go through some highlights. He couldn’t provide his considered opinion on the findings, though he both agreed and disagreed with some issues. When it was pointed out that the Oslo-funded report had been critical of the Japanese role in the peace process, particularly as a member of the four-member Sri Lanka Peace Co-Chairs, namely the US, EU, Norway and Japan, Akashi rejected the notion. The Norway report also blamed the US, India and China for throwing their weight behind Sri Lanka after major battles erupted in the Northern and Eastern Provinces. Akashi reiterated Japan’s commitment to Sri Lanka’s post-war recovery process, while expressing satisfaction over the accomplishments since the conclusion of the conflict in May 2009. In spite of financial constraints back at home, Japan sustained its economic support by way of concessionary loans, grants and technical assistance. Prof. Peiris said that Sri Lanka appreciated support extended by Japan and its understanding of the situation here. Be careful with this old yellow monkey. He plays very diplomatic role to promote Japanese market in Sri Lanka. Roshan may be a diaspora kotiya, hiding under a Sinhalese pseudonym, because of his consistent support of diaspora Tamils’ nationalism and separatism instead of peace and harmony as ONE UNITED NATION AND ONE COUNTRY. ‘Roshan’ shows his ugly nature by calling Mr Akashi a ‘yellow monkey’. How disrespectful and disgraceful! I suppose because he is actually a diaspora Tamil or a supporter of Tamil nationalism in SL, he is angry at generous Japanese aid to SL, in our effort to be a developed nation in SE Asia. SL welcomes trade relations with Japan, Russia and China more than with India, who has continuously supplied us with shoddy goods and steal our fish stocks from our maritime boundaries. Malaysia, Thailand, Indonesia and Vietnam have also improved trade links with SL. This is excellent! Not only a yellow monkey. Mr Akashi is a slimy snake as well. He has been leading our nation down the garden path for many a year. Why isn’t Mr Yellow Monkey’s interference in our sovereign affairs not classified as being interventionist? If a westerner behaves similarly, there will be burning coffins carried around protesting against “interference”. I feel sorry for you. I thought you are smart enough to understand the so called diplomatic role, but you are a peanut. you just blindly belive what is in the news and you are ready to support to the Sri Lankan government at any cost for the sake of your safe stay in abroad (Diaspora forever. In fact, I dont have any personal hatress with Japanese government,but I dont like their double role. Yesterday it was Cambodia today It is Sri Lanka, who is tomorrow? Afghanistan….., Remember Japan is a proxy of USA.